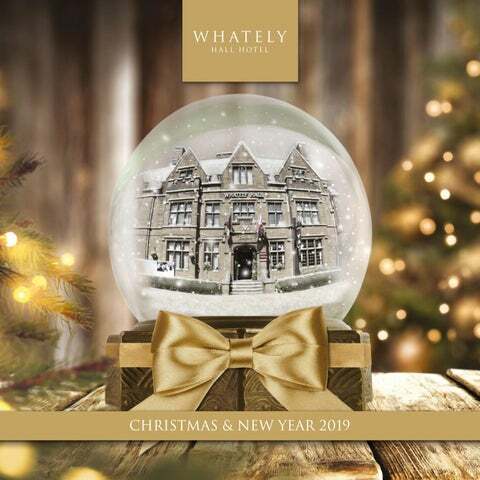 Join us for a Christmas to remember at Whately Hall with fine wines, glittering entertainment and the highest standard of food and service. Whether you are looking to hold a private lunch or evening party, or to join one of our fantastic shared party nights, perfect for smaller groups, we have something to suit everyone. Christmas Party Nights Enjoy a delicious three course meal accompanied with half bottle of house selected wine per person, festive novelties and dancing with our fantastic DJ who will be playing all the dance floor classics. Dinner Menu Lightly spiced carrot and sweet potato soup with toasted pumpkin seeds Chicken liver parfait served with red onion marmalade and mixed leaves Goat’s cheese and beetroot salad with toasted bloomer bread Roasted fillet of hake with a chardonnay and dill cream sauce Proscuitto wrapped turkey ballotine, onion stuffing, pigs in blankets and a tarragon jus Wenslydale, leek and clotted cream pasty crown and a tarragon jus All served with roast potatoes, honey glazed root vegetables and brussel sprouts Traditional Christmas pudding with Irish crème anglaise Glazed lemon tart and raspberry coulis Tiramisu slice with ginger crumb Arrival from 6.30pm • Dinner served in marquee at 7.30pm • Disco until midnight • Bar until midnight • Carriages midnight Why not make a night of it? Stay overnight from £70 per room bed and breakfast (based on 2 adults sharing). Private Party Nights Our new marquee for Christmas 2019 has capacity for up to 150 people to be seated together in one private area. Along with private bar, dance floor and DJ we’ve got everything you need to make sure your colleagues, friends and family have a memorable celebration this Christmas. So say goodbye to those long coach journeys further afield and speak to our sales team today. Arrival Reception and Canapés Get your party off to an ultimate start and treat your colleagues, friends or family to a selection of canapés on arrival with a cold glass of bubbles. Account Bar Avoid long queues by setting up an account bar for a hassle-free festive party. Organiser Offer Complimentary bedroom for the organiser (subject to availability) based on minimum numbers. Make a Night of It Make a night of your celebrations and spend the night with us. Stay overnight from £70 per room bed and breakfast (based on 2 adults sharing). Pre-booking is required. Please call 01295 253261 option 2 to book direct with our sales team or email h6633-sb@accor.com. Lunch with Santa A magical afternoon for the whole family The magic of Christmas arrives early, on Sunday 15th December 1pm - 3pm, Santa will be at Whately Hall Hotel for your child to meet and get on the good list. Lunch with Santa A splendid three course Sunday lunch for the whole family. Adult price includes three course lunch. Child under 12 price includes meeting Santa, a small gift, three course lunch. Christmas Day Lunch A family feast without the fuss Let us take the hassle out of Christmas leaving time for you to relax with your family and friends. Enjoy a leisurely three course festive lunch in our wooden panelled historic restaurant with views of our gardens and a visit from a Santa with a present for all children under 12. Glass of bubbles or soft drink for all on arrival. New Year’s Eve Celebrations See in 2020, in style Join us to see in the new year in style. This year our New Year’s Eve Gala celebration takes place in our Garden Marquee. Enjoy a sumptuous five course dinner before enjoying live entertainment and dancing until the early hours. (based on 2 adults sharing) Add an extra night for £50 per adult includes dinner, bed and breakfast (based on 2 adults sharing). January Party NightS If you have been too busy through the entire Christmas season with no time to relax and enjoy - then it is not too late to celebrate with friends, family or colleagues. Ask about our January party nights on Saturday 4th January and Saturday 11th January. Private parties catered for up to 150. Call our sales team to discuss further. For a real celebration upgrade to a celebration afternoon tea with a glass of prosecco or mulled wine.